Our continuing work for the people of Haiti. For my tech minded friends…. Computer lab work is under construction now that the carpet has been laid. We should have “pods” for 20 donated Dell Optiplex GX280 computers in the next next couple of weeks or so. 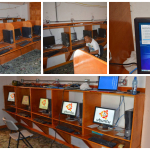 This is why technology training in Haiti is so important!